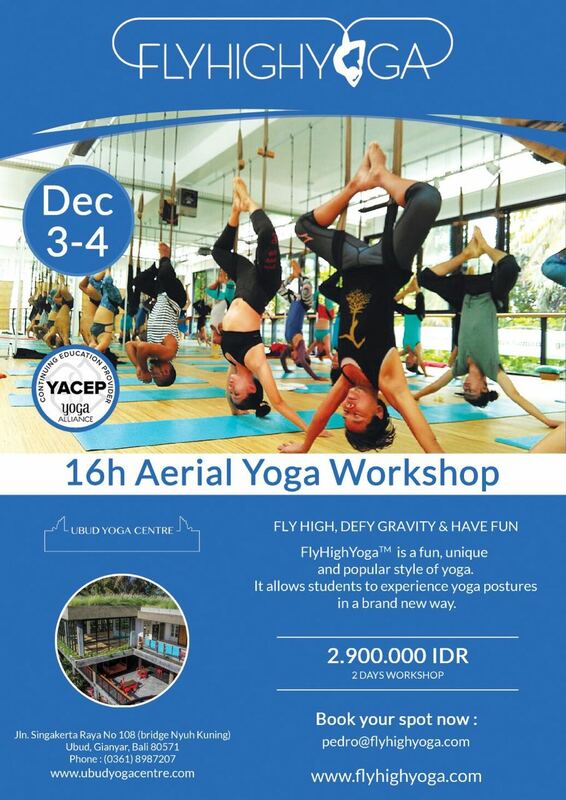 This intensive immersion will take practitioners through the most fundamental aspects of FlyHighYoga™. 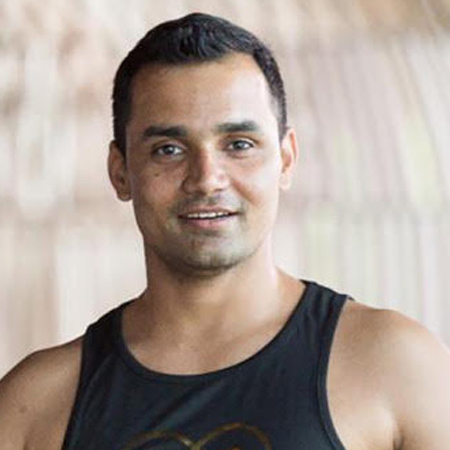 We will cover yoga belt safety, supported yoga postures including, inversions, back bends, forward bends, hip openers, shoulder stabilizers and experience linking the postures together. Through the support of the belt we create a smooth practice and better alignment, which develops a deeper connection with our Self – mind, body and spirit. To further increase the connection we will explore partner work using the belt. This is a great way to deepen your practice and learn to cooperate and communicate with other yogis. FlyHighYoga™ realigns the spine and opens the heart, which will increase your vitality so you leave the workshop feeling energized, powerful and inspired! Let’s Fly High, Defy Gravity and Have Fun! FLY HIGH, DEFY GRAVITY & HAVE FUN. FlyHighYoga™ is a fun, unique and popular style of yoga, which allows students to experience yoga postures in way they never have before. The practice is done using a top quality FlyHighYoga™ Hanging Belt, which is suspended from the ceiling. The belt is used in hundreds of different ways and the practice can be done by anyone whether they are beginners or higher-level yoga practitioners. Everyone will enjoy the class and at the same time feel challenged. FlyHighYoga™ is a versatile practice that complements any existing yoga asana practice. Besides, it is unique because there is a significant amount of creativity as well as many exclusive benefits involved. Aerial yoga is a very dynamic and restorative form of yoga, practice it alone or with a partner. To decompress the spine, the belt is placed on the body in particular spots which brings the spine to its natural curves, creates better alignment overall and teaches the body to maintain this with continued practice. Check out our spine sequence here: Explore Deep Back Bends to Balance Strength with Vulnerability. Yoga postures like handstand, forearm stand, plank and scorpion can be done with less pressure on the hands and arms. As you learn to engage specific muscles, eventually finding the grace and stability to do them in the middle of the room. 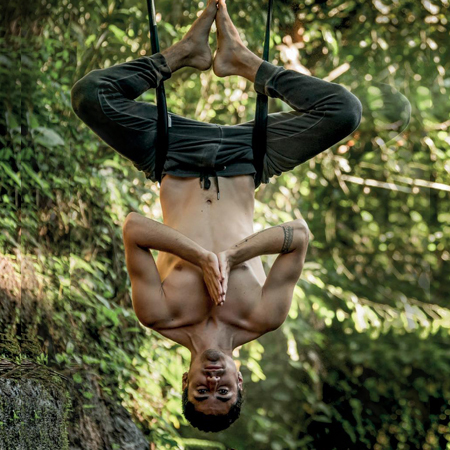 Using the FlyHighYoga™ Hanging Belt, yogis can stay in inversions for longer time periods because the pelvis is fully supported when hanging upside down. Inversions that are not usually accessible to beginners are done more easily with the belt. Yogis call headstand (Sirsasana) the king of all postures for a reason. Inverting assists the body to function more effectively and benefits every system of the body including the nervous system, the endocrine system and the lymphatic system. It floods the organs of the body with fresh oxygenated blood and it rehydrates the intervertebral discs. Together these aspects have anti-aging properties giving us a more youthful and vital body. Besides inversions, FlyHighYoga™ can be used as a tool to explore many other advanced yoga postures, which for many yogis are very hard with only a yoga mat. Feedback from FlyHighYoga™ practitioners often mentions that the splits (hanomanasan) is much easier with the FHY belt. Specific techniques are taught using the FlyHighYoga™ Hanging Belt to increase the flexibility of the body. We also suggest that you check out our Sequence I: Engage, Flow and Inspire.